For other uses, see Spanish Inquisition (disambiguation). 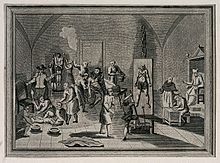 Despite popular myths about the Spanish Inquisition relating to Protestants, it dealt with very few cases involving actual Protestants, as there were so few in Spain. It should be noted that the Inquisition of the Netherlands, is here not considered part of the Spanish Inquisition. 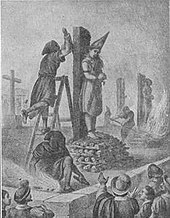 Lutheran was a portmanteau accusation used by the Inquisition to act against all those who acted in a way that was offensive to the church. The first of the trials against those labeled by the Inquisition as "Lutheran" were those against the sect of mystics known as the "Alumbrados" of Guadalajara and Valladolid. The trials were long and ended with prison sentences of differing lengths, though none of the sect were executed. Nevertheless, the subject of the "Alumbrados" put the Inquisition on the trail of many intellectuals and clerics who, interested in Erasmian ideas, had strayed from orthodoxy. This is striking because both Charles I and Philip II were confessed admirers of Erasmus. Such[clarification needed] was the case with the humanist Juan de Valdés, who was forced to flee to Italy to escape the process that had been begun against him, and the preacher, Juan de Ávila, who spent close to a year in prison. The distribution of the punishments varied considerably over time. It is believed that sentences of death were enforced in the first stages within the long history of the Inquisition. 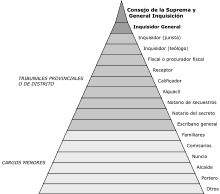 According to García Cárcel, the court of Valencia, one of the most active, employed the death penalty in 40% of the convicts[clarification needed] before 1530, but later that percentage dropped to 3%. 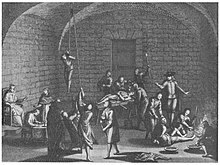 Literature of the 19th century tends to focus on the element of torture employed by the Inquisition. 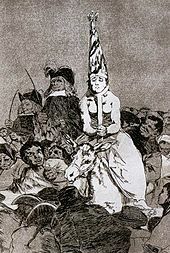 In France, in the early 19th century, the epistolary novel Cornelia Bororquia, or the Victim of the Inquisition, which has been attributed to Spaniard Luiz Gutiérrez, and is based on the case of María de Bohórquez, ferociously criticizes the Inquisition and its representatives. 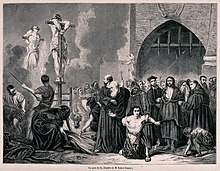 The Inquisition also appears in one of the chapters of the novel The Brothers Karamazov (1880) by Fyodor Dostoevsky, which imagines an encounter between Jesus and the Inquisitor General. 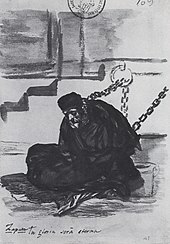 One of the best known stories of Edgar Allan Poe, "The Pit and the Pendulum", explores along the same lines the use of torture by the Inquisition. The Inquisition also appears in 20th-century literature. La Gesta del Marrano, by the Argentine author Marcos Aguinis, portrays the length of the Inquisition's arm to reach people in Argentina during the 16th and 17th centuries. The first book in Les Daniels' "Don Sebastian Vampire Chronicles", The Black Castle (1978), is set in 15th-century Spain and includes both descriptions of Inquisitorial questioning and an auto-da-fé, as well as Tomás de Torquemada appearing in one chapter. The Marvel Comics series Marvel 1602 shows the Inquisition targeting Mutants for "blasphemy". The character Magneto also appears as the Grand Inquisitor. The Captain Alatriste novels by the Spanish writer Arturo Pérez-Reverte are set in the early 17th century. The second novel, Purity of Blood, has the narrator being tortured by the Inquisition and describes an auto-da-fé. 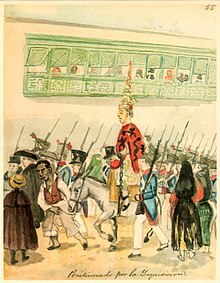 Carme Riera's novella, published in 1994, Dins el Darrer Blau (In the Last Blue) is set during the repression of the chuetas (conversos from Majorca) at the end of the 17th century. In 1998, the Spanish writer Miguel Delibes published the historical novel The Heretic, about the Protestants of Valladolid and their repression by the Inquisition. Samuel Shellabarger's Captain from Castile deals directly with the Spanish Inquisition during the first part of the novel.